After encountering the mysterious Superwoman during the "New Krypton" stroyline, Supergirl is left with two burning questions: who is Superwoman, and what gives her the right to wear the symbol of the House of El? The answers lead Supergirl into the darkest depths of New Krypton and drastically alter the Superman Family forever! Sterling Gates was born and raised in Tulsa, Oklahoma. He earned a degree in Art from the University of Oklahoma, specializing in Film and Media Arts. After moving to Los Angeles, Sterling worked as writer's room production assistant on TV's Blade: The Series, later becoming assistant to comic book industry giant, Geoff Johns. Since selling his first story to DC Comics in 2007, Sterling has written such titles as GREEN LANTERN CORPS, JUSTICE LEAGUE OF AMERICA, WORLD'S FINEST, ACTION COMICS, ADVENTURE COMICS, FLASHPOINT: KID FLASH LOST, HAWK & DOVE, JLA: VIBE, FOREVER EVIL: A.R.G.U.S., STORMWATCH, and THE FLASH: SEASON ZERO, but he is best known for his critically acclaimed run on SUPERGIRL. Alongside writers Geoff Johns, James Robinson, and Greg Rucka, Sterling co-wrote the New York Times best-selling "Superman: New Krypton Saga" graphic novel series, including SUPERMAN: NEW KRYPTON, SUPERMAN: THE LAST STAND OF NEW KRYPTON, and SUPERMAN: WAR OF THE SUPERMEN. Sterling recently scripted the MAN OF STEEL prequel comic (based on a story by David S. Goyer, Geoff Johns, and Zack Snyder) in a joint digital publishing venture between DC Comics and Wal-Mart, and he served as writer/producer on the award-winning, independent, live action superhero feature film, The Posthuman Project. 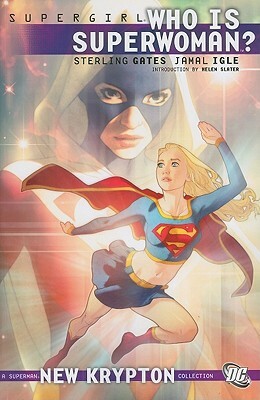 Currently, Sterling is writing ADVENTURES OF SUPERGIRL, a digital first comic book based on CBS' hit television show, Supergirl. He's also working on a number of super-secret projects he wishes he could tell you about, but seriously, they're super-secret."